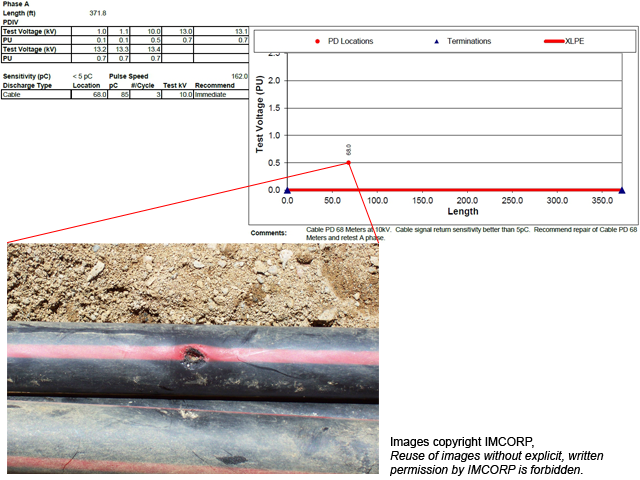 The discovery of this medium voltage power cable defect at a site in Canada provided an opportunity to demonstrate the effectiveness of IMCORP’s cable diagnostics. On a cable of over 1400 feet, IMCORP was able to locate the defect within six inches. This precision and accuracy set IMCORP apart from the rest of the cable testing community and established an early benchmark for the value of the company’s work. This particular defect was the result of deliberate sabotage. A site worker who wanted to ensure the failure of the cable in the near future compromised the cable’s jacket slightly with a hand drill. By employing IMCORP’s proprietary Factory Grade® technology, the defect was located and repaired before the cable actually failed, effectively saving the company from a potentially expensive outage.